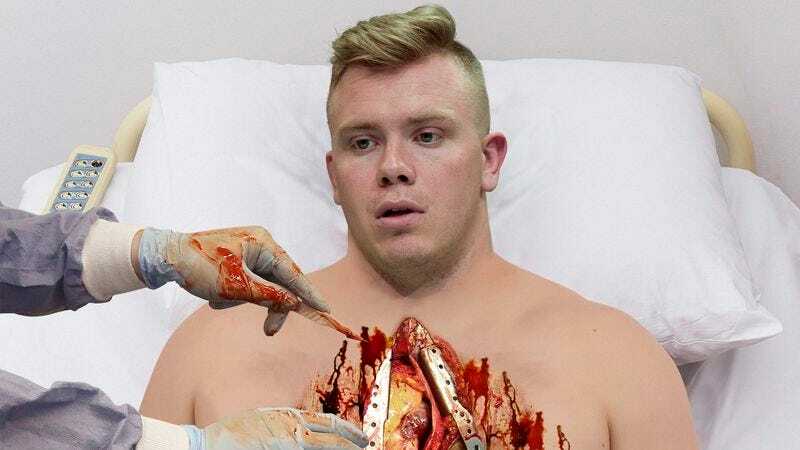 INDIANAPOLIS—Noting that the test’s significance has continued to wane ever since its debut in 1987, NFL officials announced Monday that the league’s scouting combine will phase out the process of subjecting draft prospects to vivisection. “While studying the internal organs of top draft prospects has long been one of the most anticipated and discussed elements of the combine, it is increasingly clear that teams no longer place enough value on these results to justify its inclusion in the evaluation process,” said NFL spokesman Greg Aiello, acknowledging that the test faced scrutiny after a string of several high-profile draft prospects failed to have any meaningful impact in the NFL despite impressing scouts with their cardiovascular systems, musculature, and bone strength during the live dissections. “Coaches and general managers have told us that they now see little correlation between such observations as the weight of a player’s lungs and their ability to produce on the field. We have also found that more players than ever before are choosing to forego their vivisection at the combine rather than risk damaging their draft stock, making the decision to eliminate the assessment a fairly easy one.” The NFL also confirmed that, with the termination of the test this year, Mark Sanchez would remain the only player to have achieved a perfect score on his combine vivisection in 2009.